The USAID/Uganda Monitoring, Evaluation and Learning Program, also referred to as The Learning Contract, was a five-year activity that supported the Mission’s Program and Policy Development office. USAID/Uganda contracted QED to implement this program, the first USAID Mission-level platform devoted to Collaboration, Learning and Adapting (CLA). 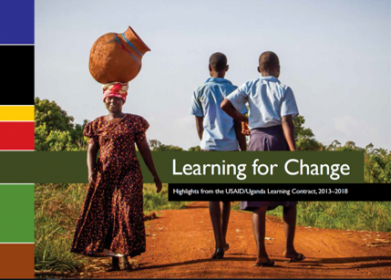 By bolstering USAID/Uganda’s capacity in CLA, the Learning Contract helped shape the Mission into an adaptive organization with an emphasis on learning. QED strengthened monitoring, evaluation and learning (MEL) systems; institutionalized learning and adaptive management practices; and leveraged strategic development partnerships to promote network building and knowledge sharing. The Learning Contract helped to create an environment at the USAID/Uganda Mission where high-quality evidence is valued, and lessons are generated and collaboratively shared with stakeholders to inform decision-making, ensure optimal resource allocation, and promote adaptive program management. A pivotal turning point in The Learning Contract was the Child Forum in October 2015. The basis of the child forum was research and predictive analysis that showed that a focused and strategic approach was needed to deal with the state of the Ugandan child. The Child Forum brought together more than 700 participants from all over Uganda and focused on four thematic areas of child well-being: health & nutrition, education, social protection, and child participation in decision-making, with special attention paid to young girls. Out of the Child Forum came a country-wide commitment to refocusing on Uganda’s youth to secure the nation’s future. Following the successful Child Forum, QED produced “The State of the Ugandan Child – An Analytical Overview”, building on the foundation of the forum and highlighting a path forward. These guided discussions led into a new Country Development Cooperation Strategy (CDCS), which serves as one of the greatest successes of The Learning Contract. The document is based on a systems-thinking approach that incorporates human-centered design (HCD) and outlines an integrated development strategy in Uganda, with a particular focus on Uganda’s new priority that youth are to be included in development activities. Following successful completion of the new mission-wide CDCS, QED also played a leading role in developing an innovative Performance Management Plan (PMP) which details how monitoring, evaluation and learning will be built into the mission’s program cycle. This approach was also carried forward into improvement of the mission’s Performance Reporting System (PRS) to ensure the effective tracking of progress towards the goals described in the new CDCS. As part of the Learning Contract, QED conducted 16 evaluations, special studies and assessments; supported 51 USAID/Uganda tasks and 87 IPs in developing 14 activity MEL plans; assessed 62 indicators in formal data quality analysis processes; synthesized 16 evaluation reports; fielded 33 local consultants and 28 international consultants; and developed 3 how-to guides.